Hi everyone! It’s sneak peek time at The Alley Way Stamps and we are featuring the new June release. These mushrooms are SO beautiful. I colored them with Copic markes and made a watercolor background using Distress inks. Be sure to check the TAWS blog for more inspiration and info on how you can win this stamp set. Don’t miss our blog hop on May 31th and the release day on June 1st! Wow, diese Farben! Bin absolut begeistert vom Hintergrund - so eine schöne Feen-Farbkombination!! I've never seen prettier mushrooms, Francine, they are beautifully colored! Thanks for joining us at the Simon Says Stamp Wednesday challenge! These are awesome mushrooms - sure to be the perfect house for a darling little fairy!! 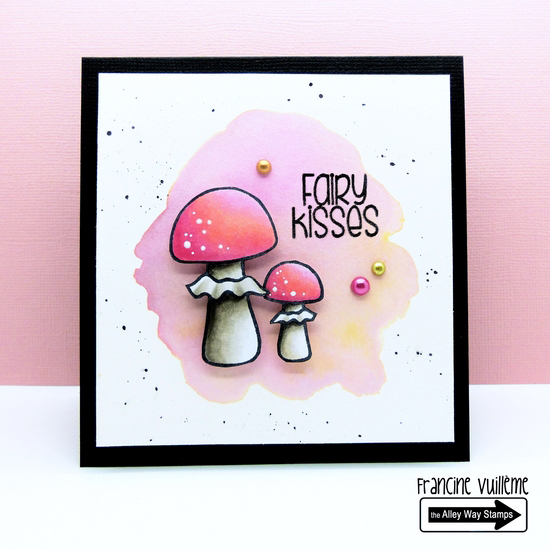 So fun and just so well done - I love the background you created for these cute mushrooms!! So fun! !